Introduction: Long range forecasting is a work in progress. Our present understanding of the atmosphere’s behavior, its interaction and feedback with the ocean, and reasons why certain patterns manifest is still in its infancy stage relatively speaking. We have progressed significantly over the past decade, such that we can foresee certain general trends with a somewhat reasonable degree of confidence. Long range forecasting can be likened to an enormous puzzle: there are innumerable pieces, some of larger size (importance) than others, but all these pieces are interconnected in one way or another. The key is ascertaining which of these pieces will be most influential in the ensuing weather pattern, and how exactly these pieces will interact with other variables. Going forward, the following discussion will analyze the principal factors for the upcoming winter, and reasoning will be provided for certain expectations. The method by which I intend to arrive at a conclusion is primarily through statistical analyses / correlations, physical forcing mechanisms, analogs, and pattern persistence. This discussion will generally concentrate on the scientific reasoning utilized in arriving at a given expectation for the modality or condition of the above variables. Given the close interaction between variables, the analysis will be organized in the following way: 1) High latitude pattern, 2) Middle-latitude pattern, and 3) Low latitude pattern, 4) Conclusion: Analogs and the Forecast. Variation in the AO has proven to follow certain patterns, many of which have a tendency to “lock in” over the course of consecutive months. The physical forcing that drives the AO into a particular modality (negative or positive) generally remains in place for the better part of the winter, such that the early winter or late fall AO state is very often a foreteller of the ensuing meteorological winter’s AO state. Put statistically, since 1950, the November AO state has accurately predicted the December-January-February mean AO state in 67% of years/cases. This is a significant positive correlation between November’s AO and the DJF wintertime AO. The AO over the course of November 2014 has been predominately negative; in fact, the AO took its initial tumble in early October and has remained generally negative since then. November’s stratospheric temperatures often offer a clue as to the ensuing winter’s AO modality. This is because the likelihood of a negative (positive) AO increases if the stratosphere is warmer (cooler) than normal prior to winter’s onset. The mechanics of such a correlation could be simplified as follows: warmth in the stratosphere generally implicates a deceleration of the westerly winds, a weakening of the polar night jet, and often times a propagation of the stratospheric warmth downward into the troposphere, where it can disrupt the tropospheric vortex, thereby turning the AO negative. The reverse can be envisioned for a cold November stratosphere. Statistically speaking, in the years available for analysis since 1979, November’s stratospheric temperature anomalies between 60N-90N at 70mb have predicted the ensuing DJF winter AO modality 71% of the time. In other words, if the 70mb temperatures in November are at or above normal, 71% of the time, the winter will feature a negative AO. If the 70mb temperatures in November are cooler than normal, the resultant AO will be positive 71% of the time. This November’s stratospheric temperatures at 70mb have been near to slightly cooler than normal thus far; however, it is likely that warming (possibly significant) will occur by the end of this month due to continued bombardment of the stratospheric vortex via upward propagating Rossby Waves. Thus, it can be assumed with reasonably high confidence that November will end with warming stratospheric temperatures and not cooling. A third factor in determining the winter AO mode is the progression of October northern hemispheric snow cover, particularly south of 60N latitude. In a theoretical sense, rapidly advancing snow cover with high snow extent should yield a chain reaction favorable for a negative AO: rapid snow advance produces stronger surface high pressure (cold / dense air), which tends to enhance the tropospheric jet stream such that vertical wave propagation is increased, and these waves reach the stratosphere, often disrupting/displacing or splitting the vortex. The resultant displacement or splitting of the stratospheric vortex can often cause a sudden stratospheric warming event, which may propagate downward into the troposphere (forcing a negative AO) thereafter. Thus, the rapid snow cover advance in October 2014 (second only to 1976) makes this winter an extremely good candidate for extensive negative AO blocking. 1. The frequency of sudden stratospheric warming events (those of major magnitude) is such that they occur every 2 winters on average. They’re not at all uncommon, in fact, the disturbance of the stratospheric vortex happens in numerous winters. It follows that a large percentage of stratospheric warming events do not directly impact the tropospheric weather pattern in a meaningful way, as evidenced by the numerous warm winters in the CONUS even during SSW winters. 2. The conditions under which a SSW event is more likely to effectively propagate into the troposphere and perturb the 500mb pattern are winters with a backdrop of -QBO / low solar activity, or +QBO / high solar activity (solar will be addressed in the next section). The overall environment is more favorable than normal for effective downward propagation this cold season due to the presence of an easterly QBO signal and generally decreased solar activity in comparison to the past few winters. Negative (positive) QBO episodes induce increased easterly (westerly) wind anomalies in the upper stratosphere, creating a more (less) favorable pattern for potential sudden stratospheric warming events. Therefore, a negative QBO in and of itself is the preferred state for enhanced stratospheric warming, which can often yield a negative AO in the troposphere. A negative QBO is in fact present right now (strongly negative in fact). 3. The timing of SSW events is such that the majority of them tend to occur in the January 1st-February 20th period, namely, the middle to latter part of winter. However, there were some cases in which SSW events occurred as early as mid/late December, and in the earliest of cases, even in the November 15th-December 10th period. I found 4 cases since 1979 in which the SSW event occurred prior to December 15th, and did result in a reversal of the tropospheric AO pattern approximately 2-5 weeks thereafter. 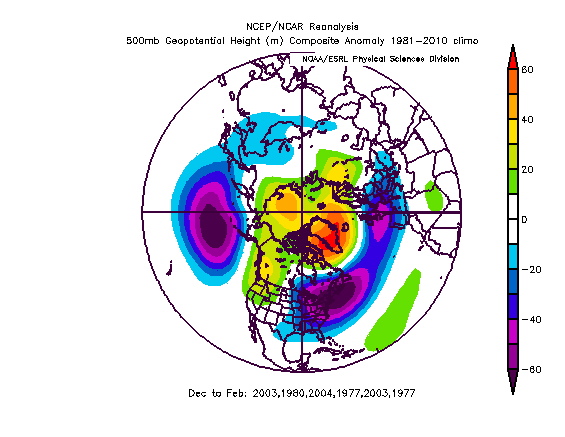 1979  SSW occurred in the beginning of December, and the AO reversed to a strongly negative state by the end of December, approximately 4 weeks later. 1981  SSW occurred in the third week of November, and the AO reversed to a strongly negative state by December 10th, about 3 weeks later. 1996  SSW occurred in mid-November, and the AO reversed to a strongly negative state by early December, about 3 weeks later. 2009  SSW occurred in mid-November, and the AO reversed to a strongly negative state by early December, about 2-3 weeks later. This year has a heightened probability of featuring an earlier than average SSW event due to the disturbance of the stratospheric vortex since October via upward propagating Rossby waves, the very impressive snow cover advance, as well as the backdrop of an oncoming El Nino and negative QBO. These SSW’s are always difficult to predict – their timing, and whether we’re looking at a wave 1 / displacement or wave 2 / splitting. Speaking of which, it’s important to note that about 50% of displacement events do not effectively propagate while the vast majority of splitting events (vortex) do. However, the displacement events that do effectively propagate generally feature the backdrop of other aforementioned conducive indicators that do happen to be present this year. While this does not guarantee effective downward propagation, this season has a much higher than usual probability for both an early-season SSW and downward propagation into the troposphere. All in all, I would anticipate a gradual warming of the stratosphere over the next week. Heat flux has already been quite high due largely to the snow cover feedback. There is a high chance for a SSW to occur by early December, which would implicate a tropospheric disturbance approximately 2-3 weeks later, namely, the onset of strongly negative AO conditions by mid to late December. One may ask the following: is a negative AO winter contingent upon the occurrence of a SSW? The short answer is definitely not. The totality of other variables suggests a high likelihood of negative AO conditions, without even considering a potential stratospheric warming event. Given the above, all of the available evidence points to a heightened probability for the AO to average negative, perhaps strongly so, for DJF. Like the AO, the NAO does follow certain patterns of persistence such that a negative or positive NAO can often dominate for a few consecutive months. A statistical analysis of NAO variation since 1950 reveals a 67% positive correlation between the November NAO modality and the ensuing meteorological winter NAO modality. The NAO for November 2014 averaged negative, so this supports the idea that there is a greater than usual chance for a negative NAO winter. Another factor under consideration in predicting the long range NAO state is the precursor sea surface temperature anomaly pattern in the Atlantic Ocean. Specifically, the orientation of warm and cold sea surface temperature anomalies in the Atlantic during the prior warm season has shown to be a strong predictor of the ensuing winter NAO state. Put statistically, there is a 75% correlation between the summer SSTA orientation in the Atlantic and the DJF NAO modality. This particular summer’s SSTA orientation in the Atlantic was quite similar to the summers that preceded a negative NAO averaged winter. Thus, this variable supports the first point in suggesting a higher probability for an overall negative NAO winter. Solar variance has often shown to affect tropospheric weather patterns, sometimes quite significantly. Geomagnetic activity, modulated by the strength of the solar wind, can impact the tropospheric height anomalies in the North Atlantic. Stronger solar winds tend to strengthen the stratospheric vortex, cooling the stratosphere, and thus tend to argue for a strong tropospheric vortex / +AO / +NAO pattern as well. Conversely, weaker solar winds, which induce lowered amounts of geomagnetic activity, tend to promote a more disturbed stratospheric vortex and thus a heightened probability for a tropospheric negative NAO/AO pattern. The statistical correlation between the NAO and geomagnetic ap index was very strong between 1970-2005, r values of over 0.70. The correlation was quite a bit weaker prior to 1970, but it remained strong in the stratosphere. This implicates that the stratosphere is an important pathway for which solar variation can impact tropospheric weather patterns. As noted earlier, often times the stratosphere is more conducive for effective downward propagation into the troposphere. There are times in which the troposphere and stratosphere might appear to behave as “Water and oil” or entirely separate (i.e., cold stratosphere, -AO/-NAO troposphere). However, much more often than not, what occurs in the stratosphere directly affects the troposphere. It follows that solar variance directly affects the stratosphere, and therefore is indirectly linked to our weather. This autumn’s solar pattern has featured low to moderate levels of sunspot numbers, solar flux, and flaring, while geomagnetic activity has remained mostly on the low side, save for a couple of bursts earlier in the autumn. Most of the flaring has been devoid of Earth-directed coronal mass ejections from the Sun, which can intensify solar winds, produce geomagnetic storms, and strengthen the stratospheric vortex. I do not believe this autumn’s solar activity has been strong or persistent enough to negate the favorable stratospheric signals as discussed earlier. Rather, continued low geomagnetic activity should bolster the notion of potentially enhanced north Atlantic blocking this winter season. The East Pacific Oscillations plays a significant role in CONUS weather patterns, and one could argue that it is more important than the NAO/AO in northern USA temperature fluctuations. Ridging in the northeast Pacific and over Alaska tends to teleconnect to troughing in the central/Eastern USA while troughing in the northeast Pacific/Alaska correlates to warmer temperatures and ridging in those same areas. A major factor under examination for the EPO was the precursor November 2014 500mb pattern. Statistically, there’s a 76% positive correlation between the November 500mb height pattern in the east Pacific and the ensuing DJF 500mb height pattern in that same region. Put another way, if we see higher (lower) than normal heights in the northeast Pacific during November, there’s a 76% chance for higher (lower) than normal heights in the northeast Pacific during the DJF winter season. In November 2014, we saw a pattern much like November 2013 – a strongly negative EPO with high 500mb heights in the northeast Pacific. This argues quite vehemently for a similar regime overall in the ensuing winter period, namely, a dominant negative EPO. The Pacific Decadal Oscillation has shifted into a strongly positive state over the past year, with warm SST’s along the Western USA coast, cold SST’s south of the Aleutians, and warm in the tropical Pacific. In fact, the October PDO value of +1.49 was one of the most positive PDO values since 1970. 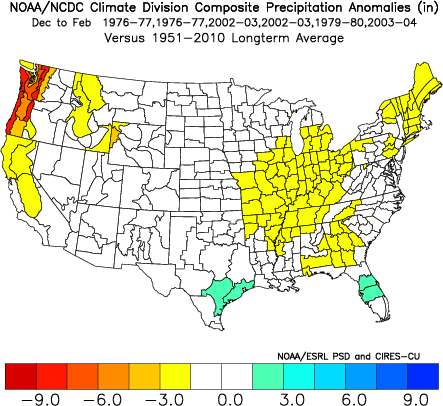 Other similar years include 1976, 1986, 1993, 1997, and 2002 in terms of PDO values. All of those years were neutral or warm ENSO events, with 1976 a weak Nino, 1986 and 2002 a moderate Nino, and 1997 a super strong Nino. This is significant in that it implies a certain pattern has been in place over the past several weeks and will more than likely continue going forward, given persistent ENSO forcing. I’m of the opinion the sea surface temperatures are more of a dependent variable, that is, result of the precursor pattern, rather than a predictor of the future. Ocean temperature anomalies can feedback and enhance a downstream pattern but they largely indicate the past – what has already occurred. This is still very important as it conveys to us the mean 500mb pattern that has been in place for the autumn – one of troughing in the Aleutians, and ridging in the northeast Pacific – both favorable signals for an ensuing winter positive PDO and positive PNA state. The Pacific North American index has a strong positive correlation to PDO values. In the aforementioned strongly positive PDO years: 1976, 1986, 1993, 1997, and 2002, they all featured a positive PNA winter, with the exception of 1993-94, which not coincidentally was the only neutral ENSO season on the list (the rest were El Nino’s). It follows that a +PDO and +PNA are anticipated for the ensuing winter, given the precursor SSTA and autumn pattern, and continued +ENSO forcing. Another factor related to the PDO is the intensity of the Sub-tropical jet stream (STJ), the latter of which is strongly correlated to the winter precipitation pattern in much of the CONUS. It has been found that warm ENSO events with neutral or negative PDO’s tend to feature a much weaker STJ, while warm ENSO events with positive to very positive PDO’s tend to feature a much stronger STJ. Physically, this makes sense as a +PDO pattern implicates a tight thermal gradient between cold SST’s southwest of Alaska and warm SST’s in the tropical Pacific, which tends to enhance the jet. Negative PDO’s feature a much weaker thermal gradient, and therefore, the STJ is not as intense or moisture laden. This season has a strongly positive PDO, and so the STJ should be more active than usual for the ensuing winter, though that does not necessary guarantee a wetter than normal pattern for the Eastern US. 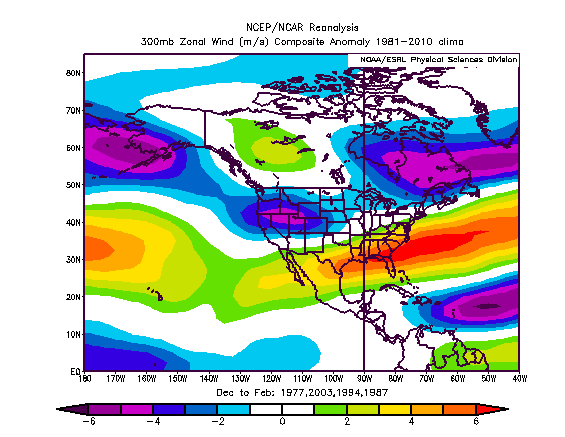 1976-77 had a strong STJ, but the extremely anomalous negative AO/NAO suppressed the STJ southward to the Gulf Coast. However, the STJ should be active this winter. Zonal winds at the 300mb level of the atmosphere can tell us the potency of the sub-tropical jet. Note the zonal wind anomalies for the aforementioned strongly positive PDO years: 1976, 2002, 1986 and 1993. Strong positive anomalies can be seen across the southern USA indicative of an intense STJ. It is apparent the current tropical Pacific SST’s are reflective of a weak El Nino event. There doesn’t appear to be any preference as to east based (Warmer water further east) or west based (warmer water further west) at this point. Whether the ENSO event is east or west based is unimportant due to the fact that the overall magnitude of the El Nino should remain weak. Therefore, the forcing is weak but basin-wide in the tropical Pacific. If the El Nino reaches moderate intensity, which is highly unlikely, then the question of east versus west based would become more crucial. However, given history of ENSO progression/timing, and forecast model guidance, it seems probable that a weak El Nino will be the dominant signal this winter season. 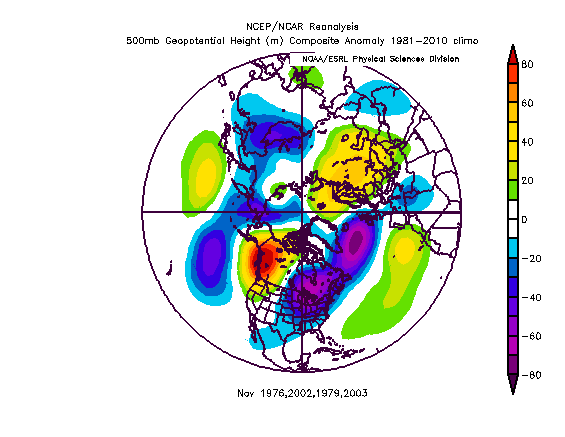 1976 and 2002, and to a lesser extent 1979, featured a fairly similar autumn progression in terms of the northern hemispheric 500mb pattern – troughiness dominating in the Aleutians, ridging in the northeast Pacific, and general blockiness across the Arctic region. 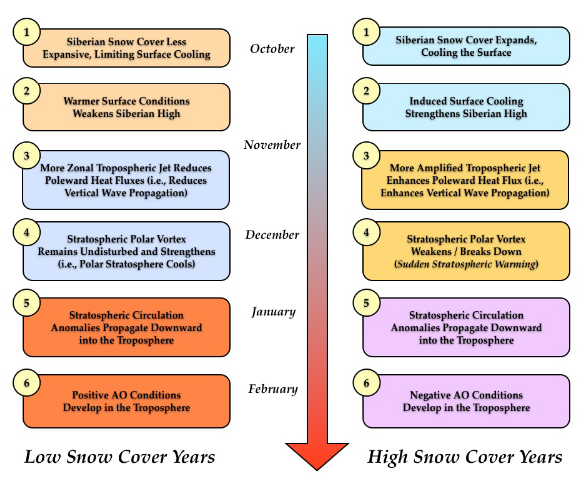 Interestingly enough, the snow cover advance was also similar in progression to both 1976 and 2002. Furthermore, the backdrop of a very positive PDO, negative QBO, and oncoming El Nino supports the idea that the aforementioned years share strong resemblance to 2014. 2003-04 was included specifically because of its similarities to 2014 in tropical forcing progression, QBO state, and some pattern similarities. 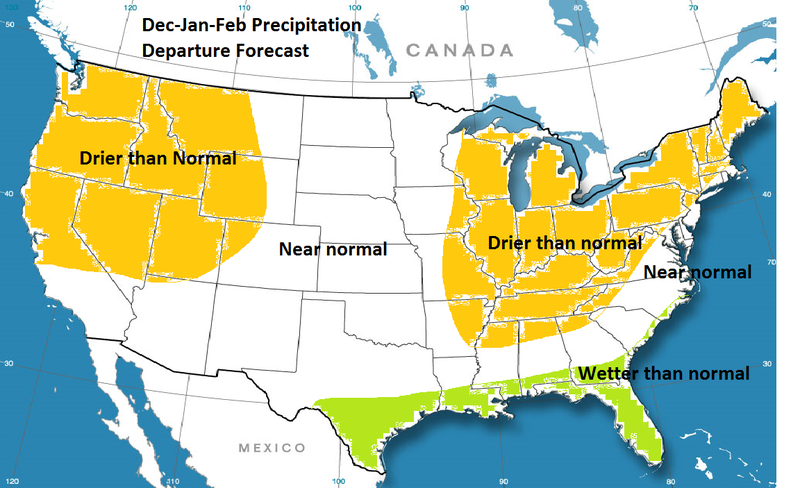 As far as the weather pattern in the United States for these years, there might be a tendency for a slow start to winter, particularly from the Mid-west westward. The East Coast might have a colder than normal December due to a second half recovery, but in the warmest case per the analogs, the Eastern US could finish December “near normal” in the temperature department. The take-away from the analogs in December is a lot of variance, with the first couple weeks of the month possibly warmer than normal, and an improving pattern as the month wears on. 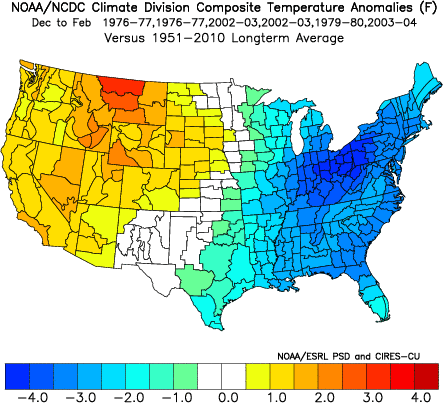 January and February have strong consensus in the analogs as very cold months for the USA from the Plains eastward. It is in this time frame that high latitude blocking could reach a climax, inducing some of the coldest anomalies of the winter season. 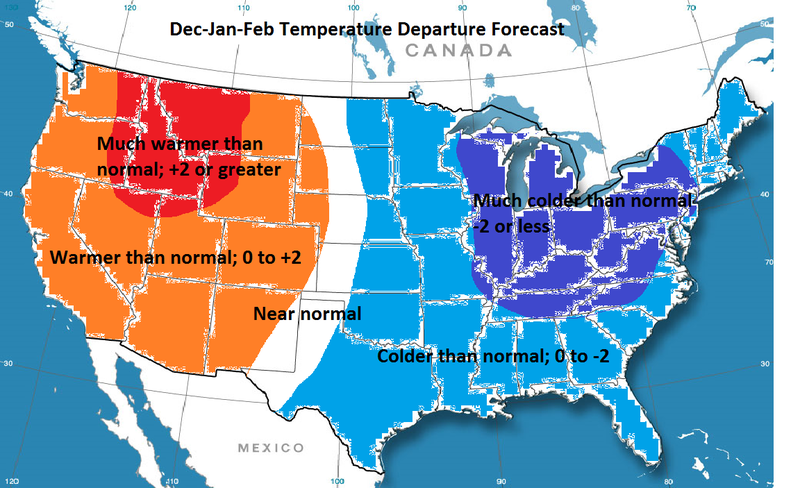 The totality of the Dec-Jan-Feb period has a strong likelihood of being colder than normal from the Mid-west eastward, in fact, much colder than normal is possible for parts of the Mid-west and East. The Southeast US, Mid-Atlantic, and coastal Northeast could have colder temperature departures than 2013-14, as most of this area finished only slightly colder than normal for last winter. 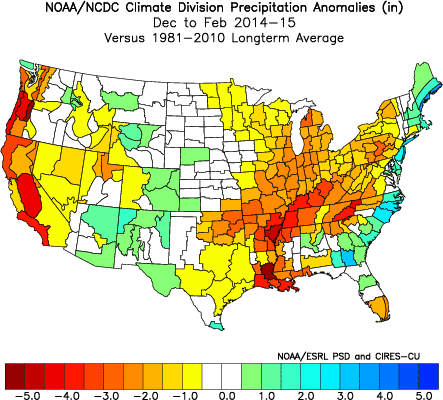 Precipitation wise, the analogs suggest a drier than normal pattern for most of the Mid-west, Ohio Valley, and interior Northeast, with generally near normal precipitation near the immediate east coast, and above normal precipitation along the Gulf Coast. If I had to lean in a specific direction for the coastal Northeast, it would be toward slightly drier than normal rather than slightly wetter than normal. 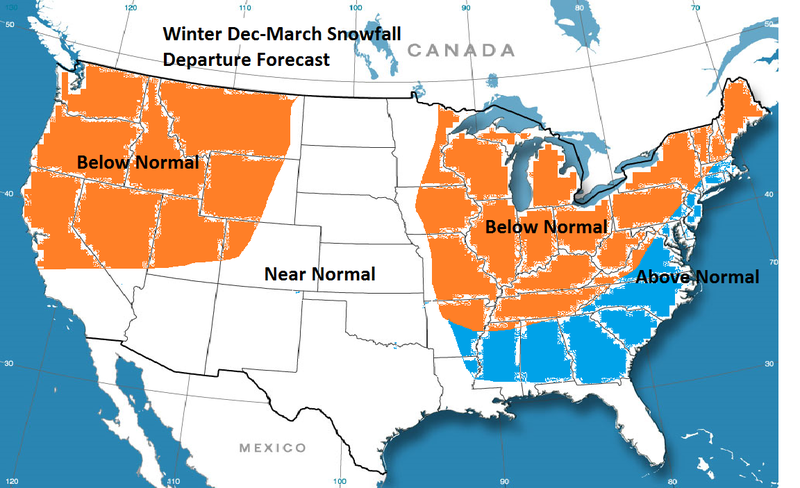 However, in terms of snowfall, due to the increased probability of cold temperatures and favorable pattern supportive of frozen precipitation, I anticipate that snowfall will be above normal for the coastal Northeast, and below normal in the interior Northeast. Normal to drier than normal winters can still produce above normal snow in the coastal Northeast due to the relatively low snow averages in comparison to locations further northwest. Will there be as much snow as last winter? That is a question which I cannot honestly attempt to answer. But I will say that more snow than normal is highly probable this winter. I will also say that this is about as cold as I would go given the long lead time, which speaks volumes to the innumerable factors in support of a cold winter. Both the temperature and precipitation distribution were very close to what was forecasted. Coldest anomalies relative to normal in the Northeast / OH Valley, warmest in the Western US, with the Central Plains as the battleground. Dryness generally prevailed nationwide with the exception of the active storm track along the East Coast. The forecast called for a very cold winter with the targeted coldest months of January and February based upon the analogs. The departures were even slightly colder than forecasted. Precipitation was near to slightly above normal across the area, and snowfall was above normal everywhere (much above normal from NYC northeastward;approximately 40-50″ in the immediate area). The NAO / AO index forecast busted due (likely) to higher than anticipated solar activity, which kept the stratospheric vortex cold/strong, preventing strong warming events and thus disruption of the tropospheric arctic vortex. 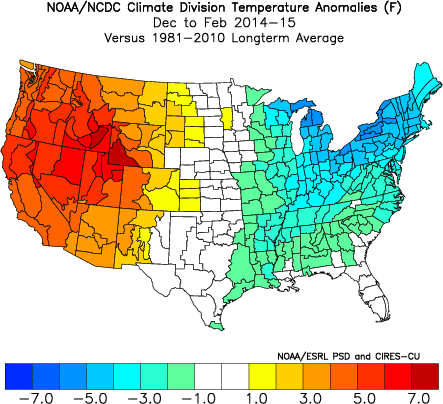 We had a +NAO/AO this winter. However, the expectation of an impressive Pacific driven pattern compensated for the lack of Atlantic/Arctic blocking. The +PDO was record breaking this winter, and likely aided in keeping the +PNA and -EPO quite robust (strong ridging in the Western US and Alaska), directing Siberian air into North America. Overall, I consider this winter forecast a success.